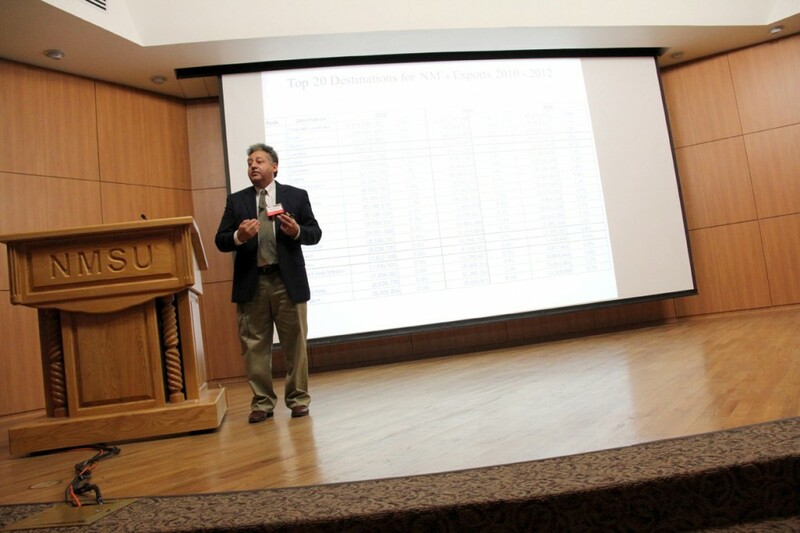 The Federal Reserve Bank of Dallas, El Paso Branch, in partnership with the College of Business at New Mexico State University, presented “the Role of Southern New Mexico in the Economy Conference” at NMSU’s Corbett Center on October 18. The conference focused on the various aspects of southern New Mexico’s economy, its past and where it is heading. Speakers included: Mark Wynne, Vice President, Associate Director of Research and Director of the Globalization and Monetary Policy Institute – Federal Reserve Bank of Dallas; Tom Siems, Assistant Vice President-Federal Reserve Bank of Dallas; Emily Kerr, Associate Economist – Federal Reserve Bank of Dallas; and Jim Peach, Regents Professor – New Mexico State University. IBA Executive Director Jerry Pacheco also was a presenter and spoke on New Mexico’s role in global trade and its commercial relationship with Mexico. The conference was attended by approximately 100 people, representing the business, public and academic sectors of southern New Mexico. IBA Executive Director Jerry Pacheco speaking to the audience.